2005 Pontiac GTOs. Lot 25 of 36. 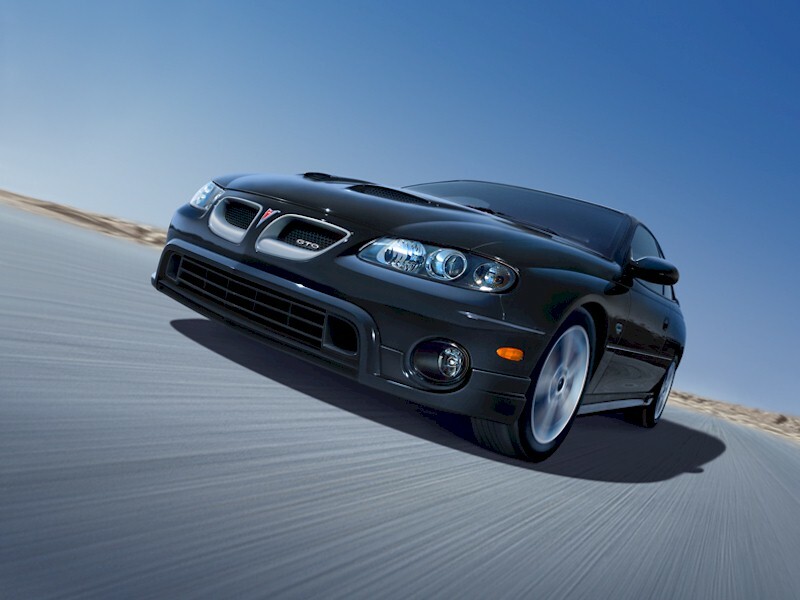 CLICK-> Phantom Black preproduction 2005 GTO with the Sport Appearance Package (Autocross) package. It is suppose to be a dealer installed option. The package consists of a different spoiler, recessed grilles, and different lower body trim panels all the way around. The option is only available on the Phantom Black, Quicksilver, and Torrid Red 2005 GTOs. This car was at the 2004 SEMA show in Las Vegas. Besides the Autocross trim, this car has some custom accessories - modified converter back exhaust, carbon fiber interior trim kit, short throw performance shifter, and polished 18-inch wheels. There is no news whether these other items will become factory options. CLICK-> Here is a close-up of the front end of this Autocross optioned Phantom Black 2005 GTO. The grilles are recessed with a gray bezel. The lower bumper grille is louvered. I don't know if it's part of the package, but the front brake caliper is red. CLICK-> Phantom Black preproduction 2005 GTO with the Autocross trim option package, rear view. There are vent louvers behind the front wheels and above the dual exhaust splitters. This package makes it a little more visually obvious that the car is called "GTO". See the big letters that are moulded into the rear bumper area? CLICK-> Here is a close-up of the front wheel on this side of the Autocross optioned Phantom Black 2005 GTO. The brake caliper on this side is metallic with GTO embossed on it. Different than the red on the other side. I wonder which one we get in 2005? With this shot, you can peek inside too. I don't see any gauges in the center of the dash above the climate controls and radio as they are with the 2005 Monaro VZ model concept. CLICK-> This Phantom Black 2005 GTO with the Autocross Sport Appearance Package is featured in this early magazine ad. It's interesting that they're not showing a stock 2005 GTO. Instead they are showing the car in the dealer installed body kit option. The 18" wheels were dropped 9/13/04 from the order guides the dealer uses to order the car from the factory. They were added again 1/10/05. We have this one in two additional sizes; 800-600 wallpaper and 1024-768 wallpaper. To get them, click on the links, then right-click on the image, and select "Set as Background". CLICK-> Here's a shot of the brakes on the passenger front of the Phantom Black 2005 Autocross GTO. Will these be the production intent ones? CLICK-> Silver Preproduction 2005 GTO. About the only big change is the hood scoops. We were told at the 2004 GTOAA International Convention in Pontiac, Michigan that there are three changes for 2005; one, hood scoops, two split dual exhuasts, and 50 more horsepower. Compare this view with a 2004 GTO. There are seven colors available on the 2005 GTO. Two of the 2004 colors were dropped, Barbados Blue and Cosmos Purple. The two new colors are Cyclone Gray and Midnight Blue. Check them out in our Stats Explorer �. CLICK-> I wonder if the hood scoops will be functional on the 2005 GTO? From this close-up shot, you can see webbing similar to the front grille. There is a Hood Delete option for 2005, in case you like the plain hood of the 2004 GTO. For 2004 you only had paint, seat color, and transmission type to choose from. There's more options for 2005 - check them out in our Stats Explorer �. CLICK-> Silver preproduction 2005 GTO, right rear view. We got split dual exhausts coming out of a newly designed rear valance. Compare with a 2004. The 2004 GTO had them both exiting out one side. How did they get the second exhaust out the back? They modifed the gas tank and reduced the trunk size to 7 cubic feet (down 2 cubic feet). There is a dealer installed Autocross option available on the black, silver, and red 2005 GTOs. The option has new front fascia extensions, side rocker moldings, rear fascia extensions with custom dual/dual exhaust tips, and a unique spoiler and front grille insert. You can check out the Autocross option install on 2004 GTOs with our Advanced Picture Searcher. CLICK-> Hey, they changed the displacement to 6.0 liters for the added 50 horsepower. This is the new LS2 6.0L (364ci) engine. It has 400hp at 5200rpm and 400ft-lb of torque at 4000rpm. The engine redline was increased from 6000rpm to 6500 rpm over the LS1. This is quite a jump. This raises the theoretical top speed from 232mph to 251mph for the LS2. You cannot actually get to this speed. You are limited by wind resistance and the engine is electronically limited to 155mph. But, you can go faster in each gear. Check it out in our Top Speed Calculator loaded with 2005 drivetrain specs. Compare the engines offered in all the GTO model years with our Stats Explorer �. CLICK-> Here's that new 400hp LS2 6.0L (364ci) engine that comes standard under the hood of the 2005 GTO. The GTO embossed fuel-rail covers have been removed. It replaces the 350hp LS1 5.7L (346ci) engine which was standard in the 2004 GTO. Here's a list of some of the changes on this LS2 engine: larger intake, stronger floating wrist pins on flat-top pistons, less-restrictive exhaust, improved heat shields, more efficient combustion chamber design, higher compression ratio, new E40 ECM with integral electronic throttle, higher lift camshaft, lighter water pump, lighter smaller oil pan, lower tension piston rings, and a crankcase vent redesign. CLICK-> Adam Wehrer tries his hand at creating a 2005 GTO. Adam tells us, "I spent a while making it but I dont know if I really like it. I wanted to put some kind of scoops on in but it was too hard to do. If someone could finish it and send me the final, it would be greatly appreciated. This is my first concept so be honest, please. Send much feedback." As with the 2004 through 2006 GTO models, we post GTO concepts created by imaginative site visitors. These concepts have been very popular and have helped to shape the looks of body kits for the new GTOs. Got any ideas? We are starting to gather ideas for the 2007 GTO. CLICK-> Here is Adam's second concept for the 2005 GTO. Adam comments, "This is a modified picture of Mike Perez's Quicksilver 2004 GTO. Mike put on a 68-70 hood look-a-like with special grilles and a custom body kit. I changed the color, fixed his body kit, added Judge decals, and a Pontiac emblem to the front. Overall, I think it makes the car look a lot better." CLICK-> This is Adam's vision of a convertible 2005 GTO. On this version he moved the hood scoops closer to the front of the car and he shaved down the spoiler. CLICK-> Here's an interesting idea. Adam shows how easy it would be to create a body kit for the 2005 GTO which would resemble the popular 1999 GTO concept car. If you want to see a whole parking lot devoted to the 1999 GTO concept car, go to the 1999 Lot by Clicking here. Says Tom Harold (harold2. @iquest.net) - "Just tried the Advanced Picture Searcher today for the first time. Amazing! I loved that I was able to look up all the stories at the click of a button."